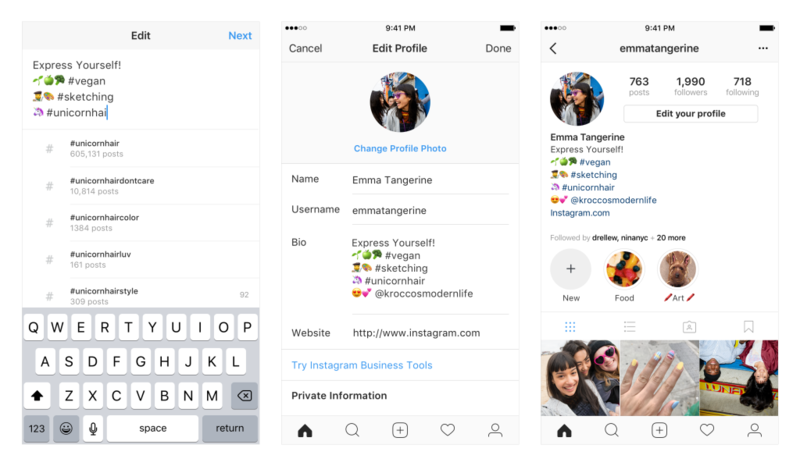 Instagram Announces Hashtag and Profile Links in account Bio. What exactly does this mean and how should you make use of these features? Keep reading to find out my top tips. Instagram has been busy lately with many new feature announcements. One that has a lot of people buzzing is the announcement that you can now have Hashtag and Profile Links in your account Bio. What exactly does this mean and how should you make use of these features? Keep reading to find out my top tips. Instagram describes the feature release as a “new way to express yourself and the things you care about.” So, how does this feature work? Now, when you include a # or @ in your bio, they can become live links that lead to either a list of recommended hashtags or to the account you target. Essentially not a ton has changed here. You could always add hashtags to your bio and include other account usernames but they previously didn’t link out. Now they can. And this can be a good thing…if used smartly. What. What? How is this NOT a good thing? Wouldn’t I want to add as many hashtags to my profile as possible? Keep in mind your total character limit for your bio has not changed. You have the same amount of space to play with, so my advice is still to use this wisely. In December, Instagram announced the ability to follow hashtags on Instagram. This meant that you could click a hashtag used in a post and either find other posts (related posts) that have used the hashtag or actually follow that hashtag and see other posts with that hashtag in your feed. You can essentially now do the same thing from your bio. But again I caution you to use this wisely. If you are using a branded hashtag this makes perfect sense to add to your profile. A branded hashtag is something unique to you or your company brand. A theme of topics that you exclusively use to promote your own stuff. This makes it easy for people to find your own related posts and keeps it related to your brand or personal identity. Posting any general and highly used hashtag is not as benefitial for this purpose. As Jenn Herman recently pointed out “Why would you want to share a hashtag that will take people away from your own content or potentially to your competitors?” A general hastag like #foodblogger doesn’t really add value to your bio. Will adding hashtags to your bio help people find you in search? While adding a hashtag to your bio in general can help you be found for a specific topic it hasn’t really been proven to make a difference in terms of the overall algorithm. As this is a new feature change we also don’t know how this will affect search and how you can potentially be found. My advice again is to focus on making your bio about you and as relevant as possibly to your own brand or business goals. What happens if you @ feature another person or account? If you @ tag another person on Instagram they will get a notification you have tagged them. This can allow that individual the ability to remove the link to their bio if they, for whatever reason, do not want to have that link be active on your profile. Can encouraging people to tag my account in their bio help me attract new followers? I have already seen people trying to use this feature to expand their brand and marketing reach. I’ve seen people use this as a type of “contest” feature hoping that having many many people link to them will help others discover their account. With respect to the possible benefits for reach or search via the algorithm there is no specific benefit to helping you be found in search. In addition, think about how often people actually look at your bio. It’s probably only when they are looking at your account for the first time. As you have a limited amount of space on your own bio I’d use that space to the maximum of my own benefit and concentrate on keeping that content relevant to my own business or brand. I’d recommend only linking to some other account if it’s related to your brand or business. For example, in my personal instagram account I link out to my business instagram account. That’s related, relevant and helps people find my own other accounts. If you haven’t looked at or updated your Instagram bio in a while, now is a good time to take a quick look and see if you can/should add any links to accounts or hashtags. For now, I recommend using these new features if it’s beneficial to your own business goals, brand or personal identity.